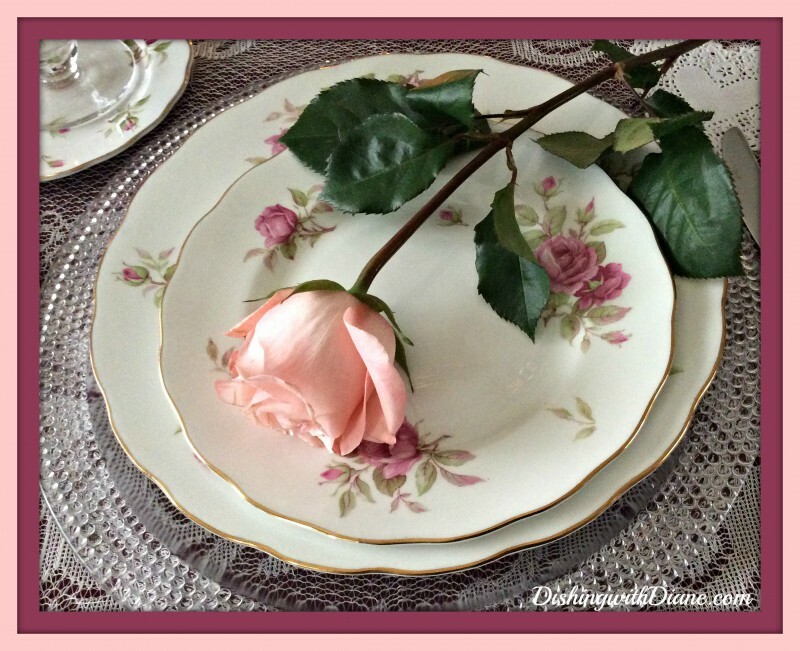 Looking for a fast easy weeknight meal? This is an Italian favorite. I make this all the time and believe me, it doesn’t taste fishy at all with the addition of the anchovies. Actually, the anchovies give it a great background taste and not a full blown fish taste. Just a depth of flavor you can’t describe. You have to try it to appreciate the flavor. 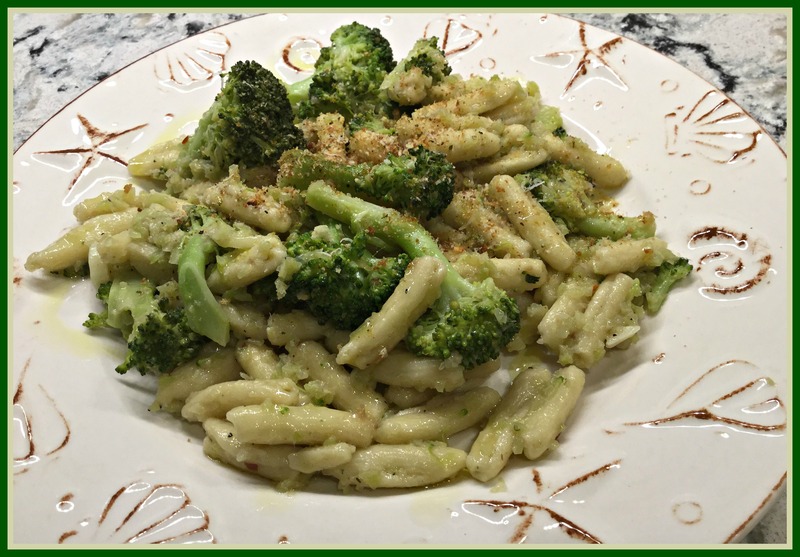 Fresh cavatelli pasta, fresh broccoli and a lot of garlic and you have a classic Italian dish. 1st step- toasted fresh breadcrumbs. Add 1 cup of bread crumbs in a dry skillet over medium heat. Cook stirring constantly until the crumbs are golden brown and crunchy, about 5 minutes. Remove from heat, add grated cheese and set aside. Separate the broccoli florets from the stalks. Peel the stalks and cut the stalks in coins. Steam the broccoli florets and coins together in a colander over boiling water or use a double boiler– (you could also cook broccoli in boiling water for 4 minutes, drain and set aside). Once they are tender, once again I separate the florets from the coins. Cook the cavatelli in boiling salted water – Cook for 2 minutes less than the recommended cooking time. Reserve some pasta water. Take the pan off the heat and add 2 tbsp. of butter and the can of anchovies. Stir well to dissolve the anchovies. Take the broccoli coins and puree them in a food processor until you get a creamy paste. 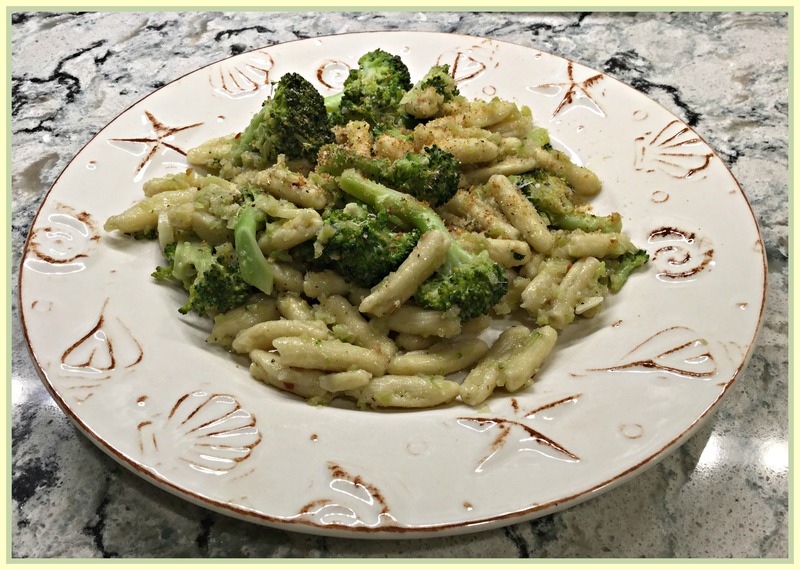 Put the pan back on the heat and add the broccoli cream, salt, pepper and one ladle of pasta water to make a sauce. Add the cooked pasta to the pan with the broccoli florets and toss until all the pasta and broccoli are well coated with the sauce. Add some of the reserved pasta water if the mixture seems too dry. Add 2 tbsp. of toasted bread crumbs to the pasta and toss. Transfer the pasta to individual serving bowls and top each serving with a sprinkling of the reserved bread crumbs. This entry was posted in Macaroni Dishes on June 23, 2015 by aries041158.